Received October 13, 2018; Revised November 8, 2018; Accepted November 8, 2018.; Published online November 14, 2018. The discovery and mechanistic understanding of target-specific genome engineering technologies has led to extremely effective and specific genome editing in higher organisms. Target-specific genetic modification technology is expected to have a leading position in future gene therapy development, and has a ripple effect on various basic and applied studies. However, several problems remain and hinder efficient and specific editing of target genomic loci. The issues are particularly critical in precise targeted insertion of external DNA sequences into genomes. Here, we discuss some recent efforts to overcome such problems and present a perspective of future genome editing technologies. The discovery and improvement of programmable nucleases (zinc finger-Fokl nuclease (ZFN), transcription activator-like effector nuclease (TALEN), and clustered regularly interspaced short palindromic repeats (CRISPR)) has brought a new era of gene editing. From ZFN through TALEN to CRISPR system adaptation, site-specific genome modification has been proven possible in many species (Kim and Kim, 2011; Nemudryi et al., 2014; Petersen, 2017; Ul Ain et al., 2015). In particular, the use of the CRISPR system enabled convenient programming and manipulation of the genome at specific target loci. Target genes can be easily eliminated or corrected, facilitating the development of radical genetic engineering and gene therapy methods (Doudna and Charpentier, 2014; Jung and Lee, 2018; Sander and Joung, 2014). However, despite the advances in genome engineering technologies, numerous challenges remain to be overcome for achieving higher efficiency and accuracy. For instance, effective transfer of programmable nucleases to living cells, tissues, or organs that contain the target gene is important for genome editing. Critical problems can also arise during the integration of foreign DNA through the double-strand DNA break (DSB) repair pathway: DNA sequence errors might be introduced at target genome sites, or the gene editing rate might be low (Cox et al., 2015). The development of methods for delivering programmable nucleases into living cells paved ways for specific gene correction in higher organisms (Cho et al., 2013; Cong et al., 2013; Mali et al., 2013). These methods broadened the targeting range, thus allowing modification of numerous genes for phenotypic screens. For genome correction by introducing target-specific genetic scissors in various organisms, it is necessary to harness the endogenous cellular DNA repair system. In eukaryotes, DSBs trigger several DNA repair pathways, including homology-directed repair (HDR), non-homologous end joining (NHEJ), and microhomology-mediated end joining (MMEJ), which are orchestrated by many DNA repair proteins (Li and Heyer, 2008; Lieber, 2010; Sfeir and Symington, 2015). The adoption of programmable endonucleases has made it possible to incorporate exogenous DNA sequences and to specifically remove target genes (Kaiser and Tagwerker, 2005)(Fig. 1). As different DNA repair pathways may occur simultaneously in a competitive manner, it can be difficult to predict the sequence of the repaired DNA repair site, where mutations could be introduced (Heyer et al., 2010; Shrivastav et al., 2008). In addition to the technical limitations that stem from the stochastic nature of DNA repair events, it is difficult to regulate programmable nucleases inside living systems. In this minireview, we describe recent efforts made to overcome these problems by using target-specific endonucleases, including CRISPR. Next, we explain recently reported genome engineering methods for efficient knock-in of exogenous DNA, and we discuss future applications of genome editing technology. Eukaryotes have two major DSB repair processes, HDR and NHEJ, which are relatively well understood. These DNA repair processes work in a mutually exclusive or complementary manner, depending on in-vivo and cellular conditions (Chapman et al., 2012; Li and Heyer, 2008; Shrivastav et al., 2008). HDR is mainly activated in the S/G2 phase of the cell cycle in higher organisms. It is initiated through sequential cooperation of various proteins, such as Rad51, Rad52, Rad54, BRCA2, and RPA. The DSB repair process occurs through (1) DNA end recognition and resection, (2) homologous pairing and DNA strand exchange, (3) DNA heteroduplex extension and branch migration, and (4) Holliday junction resolution (Heyer et al., 2010; Krejci et al., 2012)(Fig. 2A). In this process, the homogenous locus of the sister chromatid serves as the template for repair, so that the DSB locus can be repaired without introduction of mutations. NHEJ, which is active throughout the cell cycle, involves (1) break recognition, (2) end binding/synapsis, (3) end processing, and (4) ligation. The repair pathway is cooperatively conducted by proteins including Ku70/80, MRE11, Artemis:DNA-dependent protein kinase catalytic subunit complex, and XLF:XRCC4:DNA ligase 4 complex. 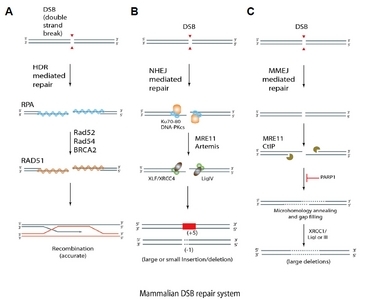 As the NHEJ pathway lacks template DNA during the cutting and pasting of DNA ends of the DSB, the repair process is intrinsically error-prone, resulting in variable DNA sequence alterations after repair (Deriano and Roth, 2013; Lieber, 2010)(Fig. 2B). In addition to the canonical NHEJ (c-NHEJ), an alternative NHEJ process, MMEJ, functions in the G1/early S phase. Unlike the typical NHEJ process, MMEJ repairs DSBs by utilizing microscopic homology sequences in proximity of the DSB (Bae et al., 2014; Sakuma et al., 2016). MMEJ repair is initiated upon localization of protein components such as PARP1, MRE11, CtIP, and XRCC1:DNA ligase 1 or 3 at the DSB location, and the DSB repair mechanism is similar to that of NHEJ (Fig. 2C); each end of the DSB is linked using 0–10 micro-homologous sequences in an error-prone process, and the repair process generally results in deletion of DNA sequences. The development of programmable nucleases has led to great advancements in target binding specificity to induce intended mutagenesis in various organisms (Kaiser and Tagwerker, 2005). Genome engineering tools can be largely categorized into ZFN, TALEN, and CRISPR systems. ZFN, the first-generation genome engineering effector, was constructed by combining a zinc finger motif, which recognizes DNA sequences, with the FokI nuclease domain (Kim and Kim, 2011)(Fig. 3A). ZFNs act as genetic scissors, because the dimerization of FokI nuclease domains activates enzymatic target DNA cleavage. 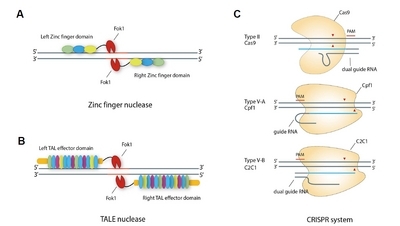 TALEN, the second-generation genome engineering effector, was also designed to function as a dimer by connecting a TAL effector-like motif to FokI nuclease domain (Joung and Sander, 2013)(Fig. 3B). TALEN can cut a wide range of target DNA through a combination of various motifs, thus providing enhanced flexibility compared to ZFN. The third-generation CRISPR system has brought unprecedented efficiency and simplicity to genome editing by utilizing guide RNA to specify the target DNA sequence, which enhances flexibility compared to ZFN and TALEN, both of which require different effector proteins for different target DNA sequences (Hsu et al., 2014)(Fig. 3C). CRISPR-Cas9 and CRISPR-Cpf1, in protein-RNA complexes, are two examples that show particularly high efficiency in inducing DSBs at target locations. Novel CRISPR programmable nucleases are being searched for in CRISPR loci of various bacterial strains. The expansion of the genome engineering toolbox has enabled targeting multiple DNA sequences simultaneously through combinatorial application of genetic engineering tools with different characteristics (Braff et al., 2016; Esvelt et al., 2013; Najm et al., 2018). Genome editing using programmable nucleases has several potential applications, including gene therapy for genetic diseases. Current exogenous DNA knock-in techniques can be divided according to which DSB repair pathway they utilize and how the external DNA is incorporated. Currently, most knock-in methods utilize HDR to insert external DNA sequences at target loci. However, these methods often suffer from low efficiency. A major obstacle in achieving high efficiency through HDR is that NHEJ dominates the cellular DNA repair pathway, whereas HDR is limited to the S/G2 phases (Bee et al., 2013; Mao et al., 2008). Several studies have attempted to increase the efficiency of HDR-mediated gene correction by modulating the nature of cellular DNA repair systems. The research group of Doudna synchronized animal cells at a specific phase using various chemical agents (aphidicolin, hydroxyurea, lovastatin, mimosine, nocodazole, and thymidine) prior to Cas9 RNA-protein complex delivery to maximize HDR efficiency (Lin et al., 2014)(Fig. 4A). The method produced a mutation rate of up to 38% in synchronized HEK293 cells, which is one of the highest rates reported for HDR-based gene editing. Gutschner et al. (Gutschner et al., 2016) attempted to maximize HDR efficiency through modulation of the Cas9 protein level according to the cell cycle and direct control of the cell cycle itself. They constructed a fusion Cas9 allele (hCas9-hGem) where the human Geminin residues (aa 1–110) were added to the C-terminus of Cas9, which allowed cell cycle-dependent regulation of Cas9 expression (Fig. 4B). Geminin-conjugated Cas9 served as a substrate for APC/Cdh1, an E3 ubiquitin ligase complex, which effectively lowered and enhanced Cas9 expression in the G1 and the S/G2/M phase, respectively. The authors reported a 1.42-fold increase in HDR efficiency using this approach. Additional cell cycle control by nocodazole treatment further increased HDR efficiency from 13.8% to 16.2%. Various studies have aimed to increase knock-in efficiency by modulating HDR and NHEJ, which are mutually exclusive processes (Figs. 4C and 4D). HDR efficiency can be reportedly increased by blocking NHEJ (Chu et al., 2015; Maruyama et al., 2015), directly promoting HDR (Song et al., 2016), or both (Ye et al., 2018). Based on a reporter-based high-throughput assay, Yu et al. found that small molecules, such as L755507 and Brefeldin A, could increase HDR-mediated gene correction efficiency (Fig. 4C) by up to 3-fold for large DNA incorporation and up to 9-fold for 1-bp substitution (Yu et al., 2015). HDR efficiency could also be enhanced by directly treating cells with small molecules involved in DSB repair. Song et al. reported that RS-1, which promotes RAD51 activity in HDR, increased the genome editing efficiency by 2–5 times, depending on gene targets, in several mammalian systems (Song et al., 2016). Charpentier et al. reported that direct conjugation of Cas9 to the CtIP motif, which participates in HDR repair, enhanced HDR efficiency by about two-fold. These studies demonstrated that HDR pathway optimization can result in higher insertion efficiency of foreign DNA sequences (Charpentier et al., 2018). Other approaches focused on the suppression of the NHEJ-mediated pathway in order to accomplish enhanced HDR efficiency. Chu et al. demonstrated that knockdown of KU70, KU80, and DNA ligase IV, which are core proteins involved in NHEJ, led to a shift from NHEJ to HDR. Knockdown of KU70 and DNA ligase IV increased the HDR efficiency by 4–5 times, and the expression of a degradation-promoting protein (AdE1B55K or AdE4orf6) increased HDR efficiency by up to 8 times (Chu et al., 2015). Maruyama et al. reported that SCR7, an inhibitor of DNA ligase IV, effectively inhibited NHEJ in a mammalian cell line and mice, increasing HDR efficiency by up to 19-fold (Maruyama et al., 2015)(Fig. 4D). Modification of donor DNA has also been reported to be effective in increasing genome editing efficiency by HDR. Renaud et al. demonstrated that knock-in by single-stranded oligodeoxynucleotides (ssODN) could be facilitated in animal cells by stabilizing the ssODN through phosphorothioate modification (Fig. 4E), allowing the usage of DNA fragments with shorter-than-usual homology arms (Renaud et al., 2016). Richardson et al. noted that, in CRISPR-Cas9-mediated DSB, the 3' portion non-target strand at the DNA cleavage site first falls off after DSB, and they designed ssODN with sequence complementarity to the exposed non-target strand, which led to increased HDR efficiency (Richardson et al., 2016)(Fig. 4F). They also reported that the HDR effect was increased by up to 60% for active Cas9 and by 0.7% for inactive dCas9. This suggested that HDR efficiency can be improved by delivering well-designed external DNA, with or without chemical modifications. Paquet et al. provided an example of such clever DNA design strategy with donor template (Fig. 4G), in which exogenous donor DNA (ssODN) contains “blocking sequences” that are mismatch DNA sequences that prevent DNA re-cleavage after knock-in in order to reduce insertion and deletion (indel) formation (Paquet et al., 2016). If desired, the incorporated blocking sequences can be removed by another round of HDR-mediated DNA sequence replacement. Zhang et al. designed double-cut HDR donors for precise knock-in, which enhanced the knock-in efficiency by about 2–5-fold relative to circular donor plasmid (Zhang et al., 2017)(Fig. 4H). Chemical conjugation of programmable nucleases and HDR donor templates reportedly increased local concentrations of DNA templates near target sites, resulting in higher knock-in rates (Aird et al., 2018; Lee et al., 2017)(Fig. 4I). In addition to modulating the DNA repair pathway and DNA donor, other approaches have been reported. Wang et al. showed that transferring external DNA fragments into cells by integration-defective lentiviral vector (IDLV) increased HDR efficiency by improving the nuclear stability of the foreign DNA (Wang et al., 2017)(Fig. 4J). Li et al. overexpressed BCL-XL to enhance HDR-mediated knock-in efficiency in induced pluripotent stem cells by more than 20%. BCL-XL overexpression increased cell viability by about 10-fold and was proposed to allow higher expression of Cas9 and sgR-NA in the cells surviving electroporation, which resulted in higher HDR efficiency (Li et al., 2018c). Recent studies showed that p53 also regulates efficiency of genome editing. Haapaniemi et al. showed that double strand break in genome editing can induce cell damage through p53 pathway (Haapaniemi et al., 2018). Furthermore, Ihry et al. demonstrated that the efficacy of genome editing can be increased by inactivating p53 (Ihry et al., 2018). Recently, Toth et al. and Li et al. reported that efficient HDR can conducted by the type V programmable nuclease Cpf1 (Li et al., 2018b; Toth et al., 2016). These studies expanded targetable genome sites beyond the limitation of the requirement for the NGG sequence adjacent to the target site, as is the case for CRIPSR-Cas9. Notably, donor DNA in HDR may not be limited to foreign DNA. A recent study demonstrated that disease-causing mutant alleles can be corrected via recombination between homologous chromosomes (Wang et al., 2018)(Fig. 4K). Similar inter-homologous allele-based recombination has also been demonstrated in tomato (Filler Hayut et al., 2017). These approaches to gene correction, without using exogenous donor DNA, opened new venues for genome editing. It has become clear that achieving high-efficiency knock-in by HDR can be difficult and often requires artificial manipulation of cellular DNA repair systems. Accordingly, various studies have attempted knock-in of external DNA sequences via NHEJ, which is the dominant repair pathway in mammals (Fig. 5A). Dai et al. reported that DNA correction could actually be conducted via the NHEJ repair pathway, by micro-injecting reporter DNA into zebrafish (Dai et al., 2010). ZFN, TALEN, and CRISPR have been applied for genome correction in mammalian systems through NHEJ-directed DSB repair. Maresca et al. used ZFN and TALEN to efficiently insert foreign genes into specific genes in higher organisms (Maresca et al., 2013)(Fig. 5B). This technology, named “obligate ligation-gated recombination” (ObLiGaRe), inserts foreign genes by NHEJ, as the target and foreign genes are cut into matching overhang DNA sequence patterns by digestion. Using ObLiGaRe, efficient gene correction at specific DNA locations can be achieved without the requirement of a homology arm for HDR. The efficiency of ObLiGaRe is higher than that of HDR-mediated gene editing. However, ObLiGaRe had the disadvantage that DNA insertion by the error-prone NHEJ process results in frequent indels at 5′ and 3′ junctions. Similarly, Wang et al. demonstrated effective insertion of GFP into the TaMLO gene in wheat protoplasts using TALEN (Wang et al., 2014). Auer et al. used CRISPR-Cas9 for effective exogenous DNA knock-in into the zebrafish genome through NHEJ instead of HDR; transgenic zebrafish showed a germline transmission rate of up to 31% (Auer et al., 2014). More recently, Suzuki et al. 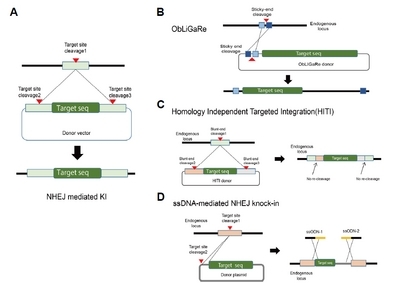 reported a CRISPR-Cas9-based knock-in strategy named “homology-independent targeted integration” (“HITI”) that enables efficient insertion of external genes into higher organisms without homology arm sequence (Suzuki et al., 2016)(Fig. 5C). This method utilizes NHEJ with clever design of donor template that allows effective DNA insertion in non-dividing cells. The authors reported effective external gene insertion in primary neurons (55.9% of transfected cells) and in neonatal mouse brain (10.6% of transfected cells). Yoshimi et al. demonstrated the usability of ssDNA-mediated knock-in via NHEJ in various organisms (Yoshimi et al., 2016)(Fig. 5D). They introduced ssODNs with sequences complementary to 5′ and 3′ junctions of the insertion into rat zygotes with target-specific nuclease and donor DNA, resulting in a dramatic increase in knock-in efficiency. The knock-in rate of offspring using this method was 17.6%, whereas the conventional method yielded no knock-in off-spring (0%). This method allowed inserting large (200-kb) foreign DNA fragments into specific loci in zygotes (knock-in offspring 6.7%) and rat genes to be completely replaced with human genes (knock-in offspring 4.3%). In conclusion, NHEJ-based knock-in methods generated promising results; however, the error-prone DNA joining at the junctions remains a major issue to overcome. MMEJ, which operates in the G1/early S phase, can be utilized for targeted exogenous DNA knock-in (Fig. 6A). Recently, Nakade et al. reported an MMEJ-based genome editing method called “precise integration into target chromosome” (“PITCh”) (Nakade et al., 2014; Sakuma et al., 2016) (Fig. 6B). They constructed a plasmid that contained short micro-homologous sequences (5–25 bp) and transferred it into cultured cells, silkworm, or frog embryos, along with TALEN or CRISPR-Cas9. 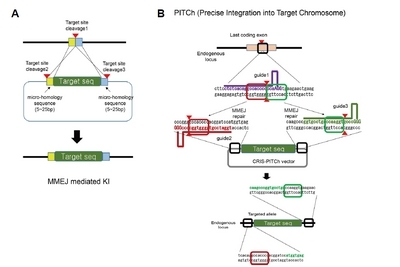 As PITCh takes advantage of MMEJ by recognizing short micro-homologous sequences and works at the G1/early S phase, it can circumvent some of the limitations of conventional HDR- or NHEJ-based genome editing. However, as MMEJ shares some of the technical disadvantages with NHEJ, PITCh also suffers from the indel problems at 5′ and 3′ junctions of DNA insertion sites. Advances in the understanding of site-specific DNA cleavage and repair pathways have facilitated the application of genome editing in various living organisms, including humans. Genome editing tools are becoming available for various purposes, including gene therapy, which raises concerns about potential dangers of unintended DNA alterations, often called off-target effects. Therefore, recent efforts in genome editing research have focused on improving the technology to meet the requirement of stringent standards in efficiency and accuracy. In this minireview, we described recent major advancements in targeted genome editing technologies with increased efficiency and accuracy. CRISPR poses the fundamental threat to precise genome editing of causing undesired mutations at unexpected loci, which sets a formidable hurdle in the application of genome editing, especially in the clinical setting (Egli et al., 2018; Kosicki et al., 2018). Various attempts are being made to mitigate the off-target problem (Kleinstiver et al., 2016; Slaymaker et al., 2016; Vakulskas et al., 2018). Notably, the research group of Liu proposed an interesting solution that enables specific conversion of cytidine to thymine or adenine to guanine at a single-base level, without DSB (Gaudelli et al., 2017; Komor et al., 2016; 2017). This approach, utilizing a catalytically inactive form of CRISPR, is a promising evolution in genome engineering technology that might complement current knock-in systems (Kang et al., 2018; Kim et al., 2017; Li et al., 2018a; Liu et al., 2018; Park et al., 2017; Ryu et al., 2018; Zafra et al., 2018). We anticipate that efforts to improve genome engineering technologies will contribute to the advancement of biological and medical research, and to the development of new therapeutics and gene therapy. Fig. 1. 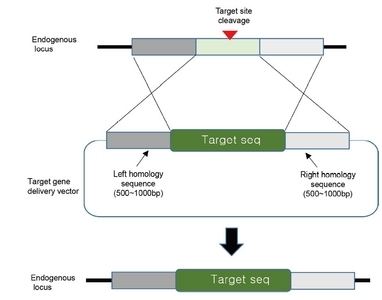 For insertion of target DNA sequences into the desired genome locus, a delivery vector contains 500–1000 bp of the left and right homologous nucleotide sequences on both sides of the target genomic locus. The target sequence can be inserted precisely by inducing HDR after endogenous genomic DNA cleavage. The green box indicates the target sequence in the delivery vector system. The arrowhead indicates the DNA cleavage site. Fig. 2. (A) DSB repair via the HDR pathway. (B) DSB repair via the NHEJ pathway. (C) DSB repair via the MMEJ pathway. Arrowheads indicate DNA cleavage sites, elliptic circles represent proteins that participate in the DSB repair pathway, red boxes and dotted lines indicate DNA insertions and deletions, respectively. Fig. 3. (A) First-generation genome engineering system: ZFN. The zinc finger module, which specifically binds the target DNA sequence, is flanked by the type II endonuclease FokI. ZFN is activated when FokI endonuclease is dimerized by left and right pair-wise binding of the zinc finger motif at the target genomic sites. Ellipses indicate Zinc finger-binding modules, orange bold lines indicate the target sequence. (B) Second-generation genome engineering system: TALEN. The TAL effector (TALE) DNA-binding module is flanked by type II endonuclease FokI. TALEN requires dimerization to cleave the target DNA sequence. Within TALEN, DNA-binding specificity can be adjusted at the single-nucleotide level. Ellipses indicate TALEN-binding modules. Orange bold line on the DNA indicates the target sequence. (C) Third-generation genome engineering system: Class (II) CRISPR endonuclease. CRISPR is composed of effector protein and guide RNA with sequences complementary to the target DNA. Red and blue bold lines indicate the protospacer adjacent motif and target sequence, respectively, and the arrowhead indicates the DNA cleavage site. Fig. 4. (A) Knock-in by cell cycle synchronization. The arrowhead indicates the DNA cleavage site. (B) A method for inserting an external gene through regulating the cell cycle and expression levels of genome editing molecules. (C) Imaging-based knock-in screening. (D) Knock-in method using inhibitors of NHEJ-mediated DSB repair. (E) High-efficiency insertion by chemical modification of the donor DNA. The arrowhead indicates the DNA cleavage site, the asterisk indicates the phosphorothioate (PS) modification. (F) Knock-in utilizing the symmetry of donor DNA to target cleavage site. Green and purple bars indicate sense and anti-sense DNA donor relative to the DNA cleavage site, respectively. (G) DNA insertion by blocking donor DNA re-cleavage after incorporation. The red arrowhead indicates the DNA cleavage site, red and blue bold lines indicate the protospacer adjacent motif and target sequence, respectively, and “M” stands for mutation sequence. (H) Knock-in via dual cleavage of the donor DNA vector. The arrowhead indicates the DNA cleavage site. (I) DNA insertion by direct linkage of donor DNA to genome engineering effector. (J) DNA insertion using the IDLV system. The arrowhead indicates the DNA cleavage site. (K) Genome correction using homologous inter-genomic crossing. Fig. 5. (A) Knock-in of exogenous DNA at the desired locus through NHEJ. The endogenous target locus and the external DNA transfer vector are cut simultaneously. Next, as the NHEJ system repairs the exposed DNA strands, the external gene enters the desired gene locus. The red arrowheads on genomic DNA and delivery vector indicate the DNA cleavage sites. (B) DNA insertion by direct joining of DNA. Zinc finger-FokI and TALE-FokI programmable nucleases generate compatible DSB sticky ends. Light and dark blue boxes indicate sticky-end cleavage sites generated by Zinc finger or TALE nucleases. (C) CRISPR-based knock-in through the generation of DNA blunt-ends and NHEJ-mediated joining. (D)DNA insertion using ssODN. Each ssODN contains sequences that perfectly match endogenous loci (gray). Donor DNA plasmid is indicated in yellow. Fig. 6. (A) Similar to NHEJ-mediated knock-in, the endogenous gene and the external DNA transfer vector are cut simultaneously. Next, the external gene is effectively inserted at the target site via MMEJ-mediated DSB repair. The arrowhead indicates the DNA cleavage site, a short (5–25 bp) homologous base sequence (indicated in light yellow and by the blue box) is shown at both ends of the target gene in the delivery vector. (B) PITCh knock-in. Each RNA guide and target DNA sequence is indicated by a bold line (purple, brown, and green, respectively), and the protospacer-adjacent motif sequence is indicated in uppercase. Arrowheads indicate the DNA cleavage sites on genomic DNA and CRIS-PITCh vector. Aird, EJ, Lovendahl, KN, StMartin, A, Harris, RS, and Gordon, WR (2018). Increasing Cas9-mediated homology-directed repair efficiency through covalent tethering of DNA repair template. Commun Biol. 1. Auer, TO, Duroure, K, De Cian, A, Concordet, JP, and Del Bene, F (2014). Highly efficient CRISPR/Cas9-mediated knock-in in zebrafish by homology-independent DNA repair. Genome Res. 24, 142-153. Bae, S, Kweon, J, Kim, HS, and Kim, JS (2014). Microhomology-based choice of Cas9 nuclease target sites. Nat Methods. 11, 705-706. Bee, L, Fabris, S, Cherubini, R, Mognato, M, and Celotti, L (2013). The efficiency of homologous recombination and non-homologous end joining systems in repairing double-strand breaks during cell cycle progression. PLoS One. 8, e69061. Braff, JL, Yaung, SJ, Esvelt, KM, and Church, GM (2016). Characterization of Cas9-Guide RNA orthologs. Cold Spring Harb Protoc. 2016. Chapman, JR, Taylor, MR, and Boulton, SJ (2012). Playing the end game: DNA double-strand break repair pathway choice. Mol Cell. 47, 497-510. Charpentier, M, Khedher, AHY, Menoret, S, Brion, A, Lamribet, K, Dardillac, E, Boix, C, Perrouault, L, Tesson, L, and Geny, S (2018). CtIP fusion to Cas9 enhances transgene integration by homology-dependent repair. Nat Commun. 9, 1133. Cho, SW, Kim, S, Kim, JM, and Kim, JS (2013). Targeted genome engineering in human cells with the Cas9 RNA-guided endonuclease. Nat Biotechnol. 31, 230-232. Chu, VT, Weber, T, Wefers, B, Wurst, W, Sander, S, Rajewsky, K, and Kuhn, R (2015). Increasing the efficiency of homology-directed repair for CRISPR-Cas9-induced precise gene editing in mammalian cells. Nat Biotechnol. 33, 543-548. Cong, L, Ran, FA, Cox, D, Lin, S, Barretto, R, Habib, N, Hsu, PD, Wu, X, Jiang, W, and Marraffini, LA (2013). Multiplex genome engineering using CRISPR/Cas systems. Science. 339, 819-823. Cox, DB, Platt, RJ, and Zhang, F (2015). Therapeutic genome editing: prospects and challenges. Nat Med. 21, 121-131. Dai, J, Cui, X, Zhu, Z, and Hu, W (2010). Non-homologous end joining plays a key role in transgene concatemer formation in transgenic zebrafish embryos. Int J Biol Sci. 6, 756-768. Deriano, L, and Roth, DB (2013). Modernizing the nonhomologous end-joining repertoire: alternative and classical NHEJ share the stage. Annu Rev Genet. 47, 433-455. Doudna, JA, and Charpentier, E (2014). Genome editing. The new frontier of genome engineering with CRISPR-Cas9. Science. 346, 1258096. Egli, D, Zuccaro, MV, Kosicki, M, Church, GM, Bradley, A, and Jasin, M (2018). Inter-homologue repair in fertilized human eggs?. Nature. 560, E5-E7. Esvelt, KM, Mali, P, Braff, JL, Moosburner, M, Yaung, SJ, and Church, GM (2013). Orthogonal Cas9 proteins for RNA-guided gene regulation and editing. Nat Methods. 10, 1116-1121. Filler Hayut, S, Melamed Bessudo, C, and Levy, AA (2017). Targeted recombination between homologous chromosomes for precise breeding in tomato. Nat Commun. 8, 15605. Gaudelli, NM, Komor, AC, Rees, HA, Packer, MS, Badran, AH, Bryson, DI, and Liu, DR (2017). Programmable base editing of A*T to G*C in genomic DNA without DNA cleavage. Nature. 551, 464-471. Gutschner, T, Haemmerle, M, Genovese, G, Draetta, GF, and Chin, L (2016). Post-translational regulation of Cas9 during G1 enhances homology-directed repair. Cell Rep. 14, 1555-1566. Haapaniemi, E, Botla, S, Persson, J, Schmierer, B, and Taipale, J (2018). CRISPR-Cas9 genome editing induces a p53-mediated DNA damage response. Nat Med. 24, 927-930. Heyer, WD, Ehmsen, KT, and Liu, J (2010). Regulation of homologous recombination in eukaryotes. Annu Rev Genet. 44, 113-139. Hsu, PD, Lander, ES, and Zhang, F (2014). Development and applications of CRISPR-Cas9 for genome engineering. Cell. 157, 1262-1278. Ihry, RJ, Worringer, KA, Salick, MR, Frias, E, Ho, D, Theriault, K, Kommineni, S, Chen, J, Sondey, M, and Ye, C (2018). p53 inhibits CRISPR-Cas9 engineering in human pluripotent stem cells. Nat Med. 24, 939-946. Joung, JK, and Sander, JD (2013). TALENs: a widely applicable technology for targeted genome editing. Nat Rev Mol Cell Biol. 14, 49-55. Jung, IY, and Lee, J (2018). Unleashing the therapeutic potential of CAR-T cell therapy using gene-editing technologies. Mol Cells. 41, 717-723. Kaiser, P, and Tagwerker, C (2005). Is this protein ubiquitinated?. Method Enzymol. 399, 243-248. Kang, BC, Yun, JY, Kim, ST, Shin, Y, Ryu, J, Choi, M, Woo, JW, and Kim, JS (2018). Precision genome engineering through adenine base editing in plants. Nat Plants. 4, 427-431. Kim, K, Ryu, SM, Kim, ST, Baek, G, Kim, D, Lim, K, Chung, E, Kim, S, and Kim, JS (2017). Highly efficient RNA-guided base editing in mouse embryos. Nat Biotechnol. 35, 435-437. Kim, S, and Kim, JS (2011). Targeted genome engineering via zinc finger nucleases. Plant Biotechnol Rep. 5, 9-17. Kleinstiver, BP, Pattanayak, V, Prew, MS, Tsai, SQ, Nguyen, NT, Zheng, Z, and Joung, JK (2016). High-fidelity CRISPR-Cas9 nucleases with no detectable genome-wide off-target effects. Nature. 529, 490-495. Komor, AC, Kim, YB, Packer, MS, Zuris, JA, and Liu, DR (2016). Programmable editing of a target base in genomic DNA without double-stranded DNA cleavage. Nature. 533, 420-424. Komor, AC, Zhao, KT, Packer, MS, Gaudelli, NM, Waterbury, AL, Koblan, LW, Kim, YB, Badran, AH, and Liu, DR (2017). Improved base excision repair inhibition and bacteriophage Mu Gam protein yields C:G-to-T:A base editors with higher efficiency and product purity. Sci Adv. 3, eaao4774. Kosicki, M, Tomberg, K, and Bradley, A (2018). Repair of double-strand breaks induced by CRISPR-Cas9 leads to large deletions and complex rearrangements. Nat Biotechnol. 36, 765-771. Krejci, L, Altmannova, V, Spirek, M, and Zhao, X (2012). Homologous recombination and its regulation. Nucleic Acids Res. 40, 5795-5818. Lee, K, Mackley, VA, Rao, A, Chong, AT, Dewitt, MA, Corn, JE, and Murthy, N (2017). Synthetically modified guide RNA and donor DNA are a versatile platform for CRISPR-Cas9 engineering. Elife. 6, e25312. Li, C, Zong, Y, Wang, Y, Jin, S, Zhang, D, Song, Q, Zhang, R, and Gao, C (2018a). Expanded base editing in rice and wheat using a Cas9-adenosine deaminase fusion. Genome Biol. 19, 59. Li, S, Li, J, Zhang, J, Du, W, Fu, J, Sutar, S, Zhao, Y, and Xia, L (2018b). Synthesis-dependent repair of Cpf1-induced double-strand DNA breaks enables targeted gene replacement in rice. J Exp Bot. 69, 4715-4721. Li, X, and Heyer, WD (2008). Homologous recombination in DNA repair and DNA damage tolerance. Cell Res. 18, 99-113. Li, XL, Li, GH, Fu, J, Fu, YW, Zhang, L, Chen, W, Arakaki, C, Zhang, JP, Wen, W, and Zhao, M (2018c). Highly efficient genome editing via CRISPR-Cas9 in human pluripotent stem cells is achieved by transient BCL-XL overexpression. Nucleic Acids Res. 46, 10195-10215. Lieber, MR (2010). The mechanism of double-strand DNA break repair by the nonhomologous DNA end-joining pathway. Annu Rev Biochem. 79, 181-211. Lin, S, Staahl, BT, Alla, RK, and Doudna, JA (2014). Enhanced homology-directed human genome engineering by controlled timing of CRISPR/Cas9 delivery. Elife. 3, e04766. Liu, Z, Chen, M, Chen, S, Deng, J, Song, Y, Lai, L, and Li, Z (2018). Highly efficient RNA-guided base editing in rabbit. Nat Commun. 9, 2717. Mali, P, Yang, L, Esvelt, KM, Aach, J, Guell, M, DiCarlo, JE, Norville, JE, and Church, GM (2013). RNA-guided human genome engineering via Cas9. Science. 339, 823-826. Mao, Z, Bozzella, M, Seluanov, A, and Gorbunova, V (2008). Comparison of nonhomologous end joining and homologous recombination in human cells. DNA Repair (Amst). 7, 1765-1771. Maresca, M, Lin, VG, Guo, N, and Yang, Y (2013). Obligate ligation-gated recombination (ObLiGaRe): custom-designed nuclease-mediated targeted integration through nonhomologous end joining. Genome Res. 23, 539-546. Maruyama, T, Dougan, SK, Truttmann, MC, Bilate, AM, Ingram, JR, and Ploegh, HL (2015). Increasing the efficiency of precise genome editing with CRISPR-Cas9 by inhibition of nonhomologous end joining. Nat Biotechnol. 33, 538-542. Najm, FJ, Strand, C, Donovan, KF, Hegde, M, Sanson, KR, Vaimberg, EW, Sullender, ME, Hartenian, E, Kalani, Z, and Fusi, N (2018). Orthologous CRISPR-Cas9 enzymes for combinatorial genetic screens. Nat Biotechnol. 36, 179-189. Nakade, S, Tsubota, T, Sakane, Y, Kume, S, Sakamoto, N, Obara, M, Daimon, T, Sezutsu, H, Yamamoto, T, and Sakuma, T (2014). Microhomology-mediated end-joining-dependent integration of donor DNA in cells and animals using TALENs and CRISPR/Cas9. Nat Commun. 5, 5560. Nemudryi, AA, Valetdinova, KR, Medvedev, SP, and Zakian, SM (2014). TALEN and CRISPR/Cas genome editing systems: tools of discovery. Acta Naturae. 6, 19-40. Paquet, D, Kwart, D, Chen, A, Sproul, A, Jacob, S, Teo, S, Olsen, KM, Gregg, A, Noggle, S, and Tessier-Lavigne, M (2016). Efficient introduction of specific homozygous and heterozygous mutations using CRISPR/Cas9. Nature. 533, 125-129. Park, DS, Yoon, M, Kweon, J, Jang, AH, Kim, Y, and Choi, SC (2017). Targeted base editing via RNA-guided cytidine deaminases in Xenopus laevis embryos. Mol Cells. 40, 823-827. Petersen, B (2017). Basics of genome editing technology and its application in livestock species. Reprod Domest Anim. 52, 4-13. Renaud, JB, Boix, C, Charpentier, M, De Cian, A, Cochennec, J, Duvernois-Berthet, E, Perrouault, L, Tesson, L, Edouard, J, and Thinard, R (2016). Improved genome editing efficiency and flexibility using modified oligonucleotides with TALEN and CRISPR-Cas9 nucleases. Cell Rep. 14, 2263-2272. Richardson, CD, Ray, GJ, DeWitt, MA, Curie, GL, and Corn, JE (2016). Enhancing homology-directed genome editing by catalytically active and inactive CRISPR-Cas9 using asymmetric donor DNA. Nat Biotechnol. 34, 339-344. Ryu, SM, Koo, T, Kim, K, Lim, K, Baek, G, Kim, ST, Kim, HS, Kim, DE, Lee, H, and Chung, E (2018). Adenine base editing in mouse embryos and an adult mouse model of Duchenne muscular dystrophy. Nat Biotechnol. 36, 536-539. Sakuma, T, Nakade, S, Sakane, Y, Suzuki, KT, and Yamamoto, T (2016). MMEJ-assisted gene knock-in using TALENs and CRISPR-Cas9 with the PITCh systems. Nat Protoc. 11, 118-133. Sander, JD, and Joung, JK (2014). CRISPR-Cas systems for editing, regulating and targeting genomes. Nat Biotechnol. 32, 347-355. Sfeir, A, and Symington, LS (2015). Microhomology-mediated end joining: a back-up survival mechanism or dedicated pathway?. Trends Biochem Sci. 40, 701-714. Shrivastav, M, De Haro, LP, and Nickoloff, JA (2008). Regulation of DNA double-strand break repair pathway choice. Cell Res. 18, 134-147. Slaymaker, IM, Gao, L, Zetsche, B, Scott, DA, Yan, WX, and Zhang, F (2016). Rationally engineered Cas9 nucleases with improved specificity. Science. 351, 84-88. Song, J, Yang, D, Xu, J, Zhu, T, Chen, YE, and Zhang, J (2016). RS-1 enhances CRISPR/Cas9- and TALEN-mediated knock-in efficiency. Nat Commun. 7, 10548. Suzuki, K, Tsunekawa, Y, Hernandez-Benitez, R, Wu, J, Zhu, J, Kim, EJ, Hatanaka, F, Yamamoto, M, Araoka, T, and Li, Z (2016). 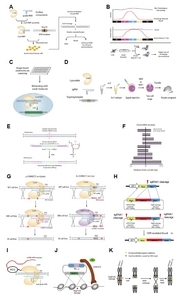 In vivo genome editing via CRISPR/Cas9 mediated homology-independent targeted integration. Nature. 540, 144-149. Toth, E, Weinhardt, N, Bencsura, P, Huszar, K, Kulcsar, PI, Talas, A, Fodor, E, and Welker, E (2016). Cpf1 nucleases demonstrate robust activity to induce DNA modification by exploiting homology directed repair pathways in mammalian cells. Biol Direct. 11, 46. Ul Ain, Q, Chung, JY, and Kim, YH (2015). Current and future delivery systems for engineered nucleases: ZFN, TALEN and RGEN. J Control Release. 205, 120-127. Vakulskas, CA, Dever, DP, Rettig, GR, Turk, R, Jacobi, AM, Collingwood, MA, Bode, NM, McNeill, MS, Yan, S, and Camarena, J (2018). A high-fidelity Cas9 mutant delivered as a ribonucleoprotein complex enables efficient gene editing in human hematopoietic stem and progenitor cells. Nat Med. 24, 1216-1224. Wang, D, Li, J, Song, CQ, Tran, K, Mou, H, Wu, PH, Tai, PWL, Mendonca, CA, Ren, L, and Wang, BY (2018). Cas9-mediated allelic exchange repairs compound heterozygous recessive mutations in mice. Nat Biotechnol. 36, 839-842. Wang, Y, Cheng, X, Shan, Q, Zhang, Y, Liu, J, Gao, C, and Qiu, JL (2014). Simultaneous editing of three homoeoalleles in hexaploid bread wheat confers heritable resistance to powdery mildew. Nat Biotechnol. 32, 947-951. Wang, Y, Wang, Y, Chang, T, Huang, H, and Yee, JK (2017). Integration-defective lentiviral vector mediates efficient gene editing through homology-directed repair in human embryonic stem cells. Nucleic Acids Res. 45, e29. Ye, L, Wang, C, Hong, L, Sun, N, Chen, D, Chen, S, and Han, F (2018). Programmable DNA repair with CRISPRa/i enhanced homology-directed repair efficiency with a single Cas9. Cell Discov. 4, 46. Yoshimi, K, Kunihiro, Y, Kaneko, T, Nagahora, H, Voigt, B, and Mashimo, T (2016). ssODN-mediated knock-in with CRISPR-Cas for large genomic regions in zygotes. Nat Commun. 7, 10431. Yu, C, Liu, Y, Ma, T, Liu, K, Xu, S, Zhang, Y, Liu, H, La Russa, M, Xie, M, and Ding, S (2015). Small molecules enhance CRISPR genome editing in pluripotent stem cells. Cell Stem Cell. 16, 142-147. Zafra, MP, Schatoff, EM, Katti, A, Foronda, M, Breinig, M, Schweitzer, AY, Simon, A, Han, T, Goswami, S, and Montgomery, E (2018). Optimized base editors enable efficient editing in cells, organoids and mice. Nat Biotechnol. 36, 888-893. Zhang, JP, Li, XL, Li, GH, Chen, W, Arakaki, C, Botimer, GD, Baylink, D, Zhang, L, Wen, W, and Fu, YW (2017). Efficient precise knockin with a double cut HDR donor after CRISPR/Cas9-mediated double-stranded DNA cleavage. Genome Biol. 18, 35.